By now it is known that an Afghan women’s robotics team, made up of a group of high school girls from Herat, Afghanistan, won a silver medal for courage in the FIRST Global Challenge in Washington, D.C. this past July, 2017. This was after their visas to the United States were denied twice, even after the girls made two 500-mile round trips to Kabul to interview in person at the U.S. Embassy. Only after a public display of support in the U.S. did the Administration allow the Afghan Women’s Robotic team to attend. In addition, since Afghanistan is still an active conflict area, the team waited months for their kit of wheels, gears, and radio controls to clear security. Meanwhile, their competitors were already working on their robots. By the time the materials arrived, the Afghans had only two weeks to assemble a working robot, but they did so successfully, getting a head start by using recycled materials, and even a Coca-Cola bottle. The teenagers are sponsored in part by Roya Mahboob, an Afghan technology entrepreneur. Mahboob came on behalf of her company, Digital Citizen Fund, a women’s empowerment nonprofit. In November, 2017, the team traveled to Estonia to compete in the Entrepeneur Challenge at Europe’s largest robotics festival, the Robotex festival. They faced off against 3700 competitors and 1600 robots. Not only did they build a robot that would solve a real world problem, they also designed marketing flyers, and presened a sales pitch to a team of judges. The winning robot, presented by three members of the Afghan Women’s Robotic team, uses solar energy to work on small farms, doing tasks like seeding and cutting crops. Next stop is another visit to the U.S. in May of this year to compete for investment money to start their own company. Information for this post obtained from K.N. Smith, contributor to Forbes, Nov 29, 2017; Amanda Erickson from The Washington Post, July 4, 2017; Camila Domonoske, NPR, Nov 30, 2017. 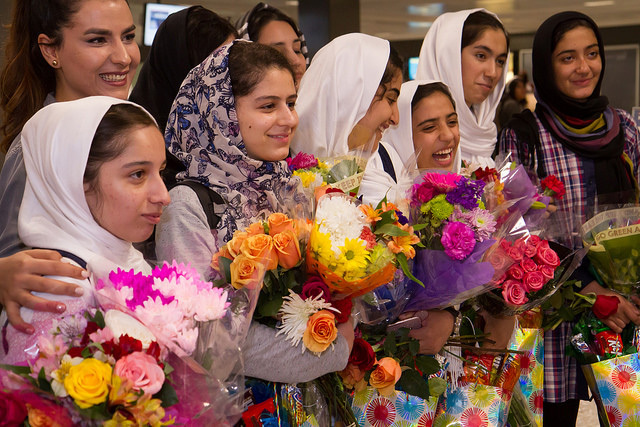 Arrival of the all-girls Afghan national team at Dulles Airport for the FIRST Global Challenge 2017, an international robotics competition for high school STEM students held in Washington.